First Steps - Johann Sebastian Bach - Mediální ohlasy - ArcoDiva management - Hudební agentura - Hudební agentura ARCO DIVA Management s.r.o. 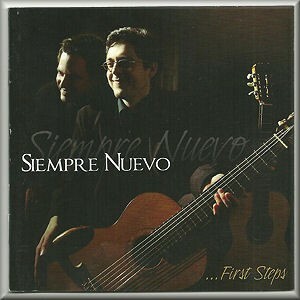 The guitar-duo Siempre Nuevo was founded in October 2007 by the two Czech guitarists Matej Freml (b. 1982) and Patrick Vacik (b. 1984), when both were studying in Weimar, at the Liszt School of Music. They went on to continue their studies, as a duo, with Thomas Müller-Pering in the sameconservatory. This is their first CD – made after a relatively brief, but successful, prize-winning career. On the first four tracks here, arrangements of works by Scarlatti and Bach, the duo play on romantic period guitars; the rest of the music is performed on modern instruments. Their Scarlatti has charm and is generally beguiling; this is particularly true of K.208. In the two allegros, K.491 and K.333, one misses the sheer incisiveness of the harpsichord or, for that matter, the dynamic range available in performances on the modern piano. These are reservations about the appropriateness of the instrumentation - I like my Scarlatti a little more percussive than it can be with a pair of guitars. But about the skill of the performers one need have no reservations at all. The duo work together perfectly, here and elsewhere on the disc, their interplay and sense of dialogue everywhere impressive, their playing always mutually complementary.